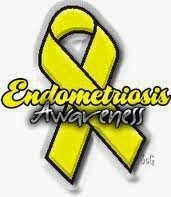 March is here and that means - Endo Awareness month. I considered not saying anything. Pretending I did not see the sudden flow of Yellow raining down my Facebook page from various Endo Organisations / pages I follow. I so dearly want to stick my head in that nice expanse of Yellow Sand I have created these past four years and scream SCREW YOU ENDO! Yet I cannot. The storyteller within urges me to speak up. So here I am, speaking softly today for tomorrow I may grow cold feet and retreat to my sand dune. Today was March 2nd in Australia and it seems rather fitting that it was today - the beginning of Endo awareness month - that I made the journey into the city to see my specialist. Three years says he. Nope nearly four I reply as I sat there waiting for my pounding heart to subside a teeny bit. My breath; caught in my lungs balled there as I imagined all the options I may be offered - options I am NOT interested in pursuing. My head battled the anguish within and my eyes blinking back tears as the specialist sat back but did not offer me options. I was given option. Singular. For 12 years I have actively battled this disease. With sword and knife (okay so sword is a bit far fetched) 20 years I have suffered (though the BCP did manage to control it to an extent throughout my early 20's) and now... well now I have a mere month to come to terms with my new path. A path to freedom - freedom from the chains of pain that weigh me down. A path to new beginnings and new life. Tonight I am raw. Processing the information from today has been almost too much and I nearly fell asleep on the couch at seven. A flood of tears is building within as I realise the next month is going to be one of the hardest I have faced yet as I deal with resulting emotions. Note: Though March is Endo Awareness month - personally I haven't quite decided how much of my new path I feel *comfortable* sharing - however I still think it needs to be discussed & as always this little space allows my words to tumble across the page & provides me with a history that is easier than trawling through my personal handwritten journals.